1. Which of the following is an invalid path for the following graph? A. The number of paths of length K from vertex Vi to vertex Vj. B. Shortest path of K edges from vertex Vi to vertex Vj. C. Length of a Eulerian path from vertex Vi to vertex Vj. D. Length of a Hamiltonian cycle from vertex Vi to vertex Vj. 9. 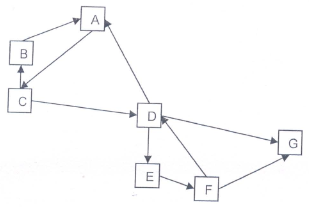 In Breadth First Search of Graph, which of the following data structure is used?